How does Sales Navigator help open new doors and drive powerful results? Learn from real-life selling experiences of the Verizon Enterprise Solutions team. It’s safe to say the team at Verizon Enterprise Solutions understands the value of connections, which formulate the very core of their business. VES specializes in communications, Internet of Things, cloud computing, networking, and more. Connecting people, devices, and data is the name of the game for this leading solutions provider. Connections are also the name of the game for the VES sales reps, and that’s why Sales Navigator is a crucial piece of their strategy. For someone like Brian Kaye, Principal Architect for the IoT Overlay Group, it’s all about uncovering those hidden links that can pave the way for an introduction and conversation. Kaye says his objective as a seller is always to get in touch with key decision-makers in an organization, but since these individuals are constantly dealing with a barrage of sales inquiries on all fronts, it can be tough to break through and capture their attention. There have been plenty of times where insights obtained through the tool opened a door that otherwise would’ve been sealed shut, Kaye says. In one instance, he was struggling to reach C-suite players at a major office supply retailer, but received an alert that the Chief Information Officer had shared a listing for a VP opening on his team. Recognizing an opportunity to capitalize on a period of organizational change, Kaye made a pitch via InMail for the ability of his solution to reduce costs and improve performance of the company’s ecommerce site. The recipient got back to him, put him in touch with his Senior VP, and things took off. On another occasion, Kaye recalls getting through to someone at another business by noticing that he went to the University of Oklahoma during an infamous football game Kaye had attended, in which the Sooners lost in bizarre fashion after their mascot ran on the field and drew a penalty. Indeed, the reference struck a chord. Kaye got a quick response. Linda DiBias, who manages content and social media marketing for VES, says feedback from the company’s employees has been overwhelmingly positive regarding the Sales Navigator program. Given her role and her experience, DiBias particularly enjoys the way insights gleaned from LinkedIn can help direct her team’s social and content strategies, shining a light on the subjects that matter to the company’s target leads and accounts. 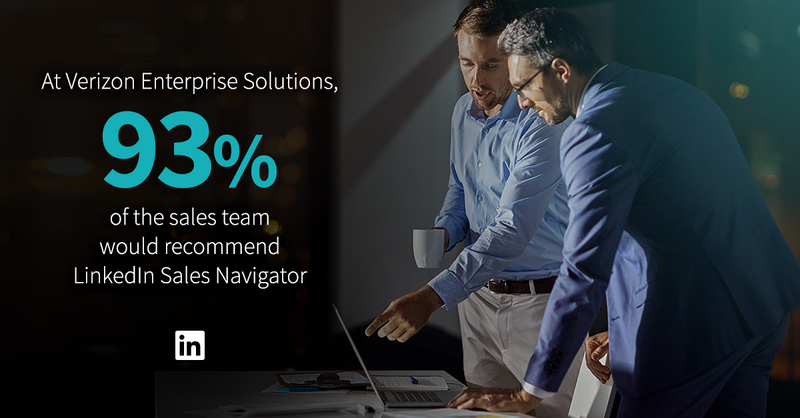 As sales and marketing become more aligned in their processes, Sales Navigator has been a powerful conduit in aiding collaboration. Whether you’re in marketing or sales, the people you’re trying to reach all crave the same thing: a personalized approach that resonates with them in a meaningful way. To learn more about the experiences VES has had with Sales Navigator, and the results they’ve achieved -- take a look at our full case study.